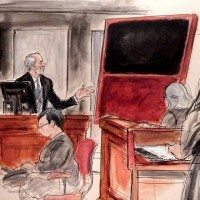 Hot this week: Can’t get enough of the Knoedler Gallery forgery trial soap opera. The Wolfgang Beltracchi film has come to Netflix, but this forger flick feels forced. The free online course Antiquities Trafficking and Art Crime opens TODAY (1 Feb) so sign up. It’s low key, move at your own pace, and hopefully informative. Want more than that? Here are your options, including online master’s courses, full master’s degrees, PhD research, etc. Contact me with any questions. Another feature on my free online course which starts 1 Feb.
For all of you watching the Knoedler trial, some forgery cases brought to you by Leila Amineddoleh. On culture crimes in the MENA region. Should the ancient Quimayas Treasure be returned to Colombia from Spain? The Quimbaya Treasure was given to Spain as a gift in 1893 but the petition claims this was not actually a legal move. The court is still deciding but the government says that the gift was legal. Police arrested a sacred art thief but said the main actors in church theft are collectors who fuel the market. The $12mill loss for the 4th quarter is in large part because of their attempt to sell the art collection of their convicted ex-chair. The unsuccessful five year lawsuit filed by the US branch of the Armenian Apostolic Church maintained that the pages were looted during WWI. The publisher used thumbnail reproductions of NYT front pages on a book cover. Tourism and cultural appropriation. The popularity of ‘Indian’ curios. In which Berk undermines his own expertise by wildly claiming that archaeologists don’t care about or study coins. The museum’s former money manager is accused of taking over $100k and 130 days worth of the museum’s financial records. I suppose a conviction is not nothing, but the market end never really goes down for their crimes. The framed pencil drawing went missing in late November or early December. Come on, Preet Bharara, let’s see some real sentences and punishment on the market end. Things get heated as Domenico De Sole, former Gucci executive, takes the stand. The artist’s daughter said that she told the Knoedler gallery folks that their Diebenkorns were dodgy but they sold them anyway. Top ones too, but the gallery sold the works anyway. “The defence seemed eager to pin the responsibility for determining the painting’s authenticity on [the buyer]”. This is a horrible, destructive idea. It is a license to loot. I can’t help but wonder if part of the problem is that a solid definition of success wasn’t made clear from the start. Quotes from ARCA’s Lynda Albertson. The 67 antique books were taken from Carton House in Co Kildare round 2006.
Who is doing the Appian Way dumping? More loot heading back from the Getty. More crack downs on Spanish church theft. Two were arrested for this theft. “It’s not the first time”. Reflecting on the spate of Spanish church thefts. Well done as the theft at Santísimo Corpus Christi in Seville occurred only 2 days before the bust. “Dedham From Langham” is claimed by the heirs of Anna Jaffé but is in the possession of the Musée des Beaux-Arts in La Chaux-de-Fonds who argues that Swiss law doesn’t require restitution. The controversial grey area of street art theft. But the coins have not been recovered. The stolen items have little monetary value but are very important to teaching programmes for school children. An interesting case about how totally unsubstantiated rumours of a piece being fake turn the art market on its head. More on the quest to find and recover missing pubic art in the UK. Suits, arguments, and competition vs centrality. More on the dispute, legal and otherwise, between the ALR and the ARG. It’s now considered unethical to deaccession items in any situation other than “as a last resort”. The argument is that if a public appeal is opened, there must be a guarantee that the owner will sell and not withdraw application of export. The street artist has been handed a 5 hour community service sentence with Brisbane’s graffiti removal service. “You could feel the taonga crying for home.” Consultations are beginning between the National Maritime Museum in London and Maori groups near where Cook first landed. The Secretary of State was particularly interested in the looted antiquities that were smuggled to the US and subsequently returned. The Denver Art Museum has FINALLY agreed to return the Rama, they just haven’t said when. The men were caught stealing items that came from a temple in in Yelang town of Tongzi county that had been destroyed in the Cultural Revolution. Announcing Shadows of Gods: an Archive and Its Images by Gopinath Sricandane. A yeas since the theft of these artefacts; daggers are back but no one arrested. Replicas, vandalism, politics, and past looting. Yikes. The Ban Chiang artefacts, part of the big California museums scandal, have been handed back. The Roman-era structure was tagged but now is cleaned. “Visual pollution”. A helicopter raid! The poor girl’s a bit battered; a masterpiece she isn’t anymore. The beaver was for everyone, now it has been stolen. The complicated balance between preserving ‘heritage that hurts’ and not inadvertently honouring it. “A total of 22 cacti have been stolen over the past several week”. The artist assumes that Wu Tang thought only one person would ever see that they used his art. The statues of the Capitoline Museum now have attractive white boxes around them.